The model 1808 is a small compact telephone entry system that is loaded with features. The distinctive styling of the 1808 makes it ideal for small residential or commercial applications. 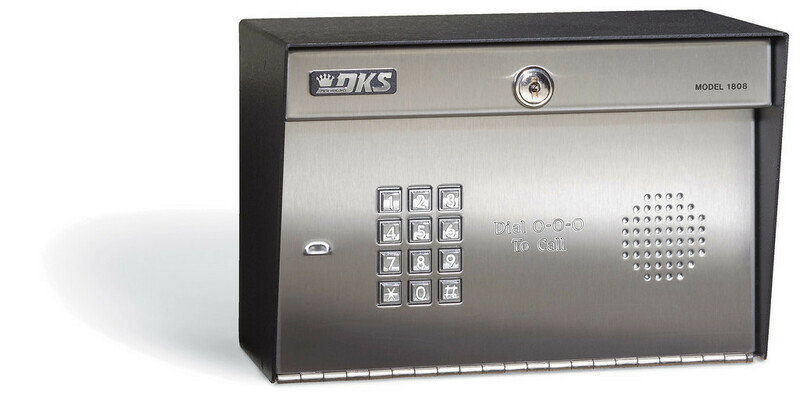 And, by adding the optional built in directory, the 1808 is ideal for small multi-home gated community applications. The 1808 is available in surface mount style only. Visitors are identified by voice communication via the telephone. Access is granted by pressing "9" on your touch tone telephone, or access can be denied by simply hanging up. The 1808 is available with or without a small, built-in directory. LED lighting illuminates keypad and directory. Surface mount dimensions: 7.375"H x 11"W x 6.375"D.